Today was somewhat unusual, four accountants and two weddings. 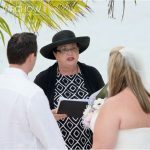 The first one took place at the Cayman Weddings office in West Bay. The couple are from Kenya, living and working in Cayman. After the signing, and the announcement of the newly-weds, there were champagne toasts and good wishes all around. 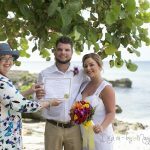 I showed them our tradition of linking arms, sip and kiss, and gave them the cork from their champagne bottle with the date and a Caymanian quarter. 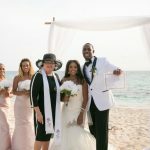 This couple opted for a beach wedding on Seven Mile Beach, Grand Cayman. They were married on the beautiful beach at Discovery Point Club. The groom is from Malawi. Did you know that over 130 different nationalities make their home in the Cayman Islands? If you live and work in the Cayman Islands you can be married by Banns being published. It is quite an easy process, but it involves an interview with your Marriage Officer, and the Banns have to be posted for 7 days before the wedding can take place. 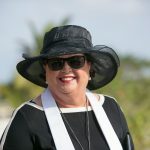 New Resident magazine, which is published locally and which hits the newsstands this month has a comprehensive article on how to get married in the Cayman Islands. Of course you can call me at Simply Weddings, and we will handle everything for you. Call +1 (345) 9499933 or drop by and see us at 306 North Church Street in the ERA Kirkconnell Building, next to Kirk Supermarket.